Ahead of tomorrow's forage walk I cycled to Red Hook for a quick look-see. It was nice to be on a moving bike. Today is very hot and very humid. Hello, Summer? You can go, now. Tomorrow's mini menu? 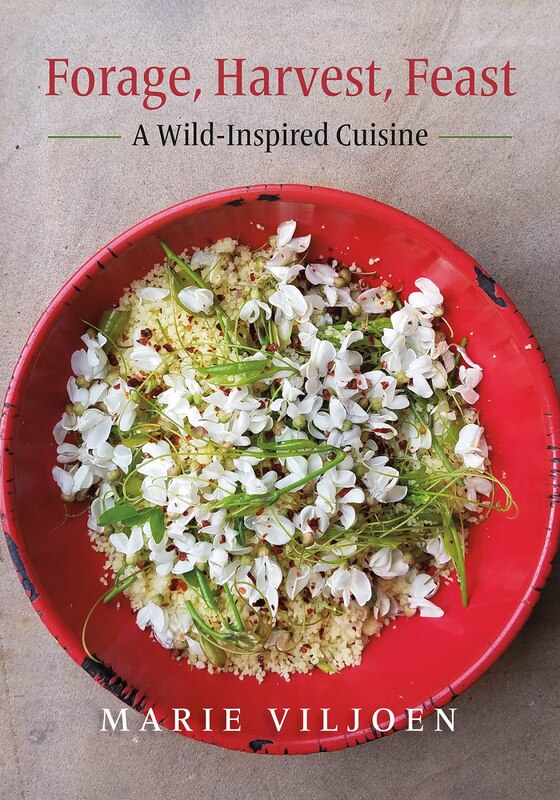 Juniper mockcocktails, purslane gazpacho, quails eggs with mugwort dipping salt. Late, late summer, and the black nightshade is ripe, on cue. I tasted these and they had a good flavour. It can vary. Noooooo. Deadly nightshade is another plant (sorry, I know I am repeating myself). The problem with common names is...? Confusion. Atropa belladonna is deadly nightshade. 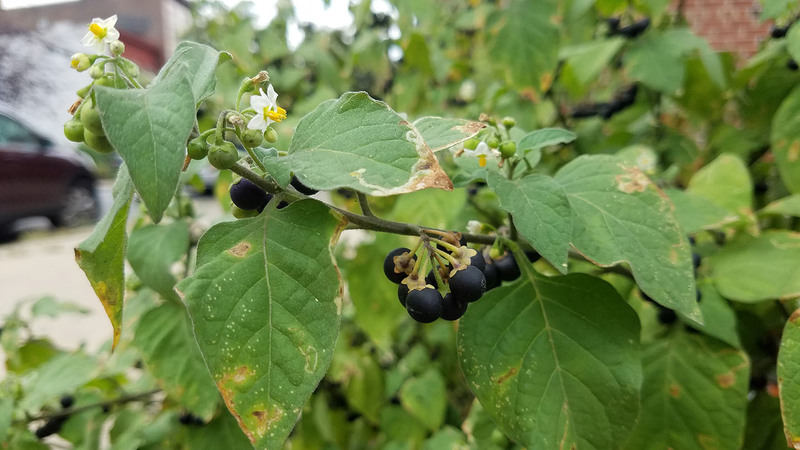 Our friend above and below, Solanum nigrum, black nightshade, is edible. 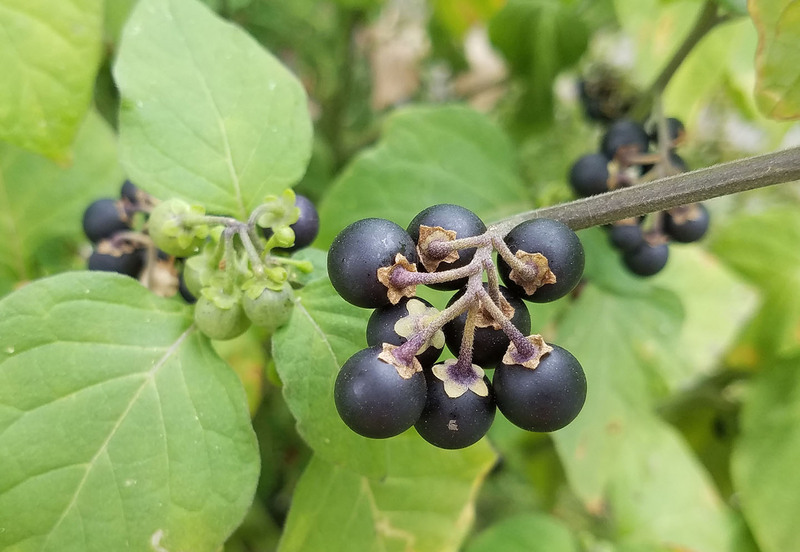 Edible black nightshade fruit occurs in clusters, above. Deadly nightshade fruit is borne singly. Black nightshade calyces (the green bits like lapels between stem and fruit) are smaller than the fruit. Deadly nightshade's calyces are prominent, like a crown or halo, extending beyond the fruit. Black nightshade has tiny white flowers. Deadly nightshade has larger, tubular, purple or lilac flowers. Incidentally, I have never seen deadly nightshade. It is not very widespread in the US, and occurs mostly on the West Coast. 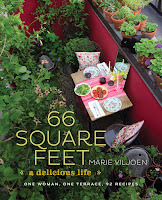 The next post will be about ungardening. I have had to let the dust settle (literally and mentally) before writing about why I pulled out the front garden this week. I'm not taking it very well.